Before we dive into exactly how to use shaving cream, let’s talk briefly about why you’d use a shaving cream in the first place, the different types of shaving creams and their advantages. It’s a bit faster and more convenient. Shaving cream basically is shaving soap – just in a different form (it’s been aerated and emulsified). So it essentially takes some of the work out of the process for you. It’s a bit easier. This is true especially if you’re a beginner. There’s a certain skill to lathering a shaving soap, and you need to practice a while before you can really work up an ideal lather. Shaving creams are essentially pre-lathered soap. It eliminates some of the guesswork. It’s a tiny bit safer. If you’re new to wet shaving, using a cream may be a bit safer. 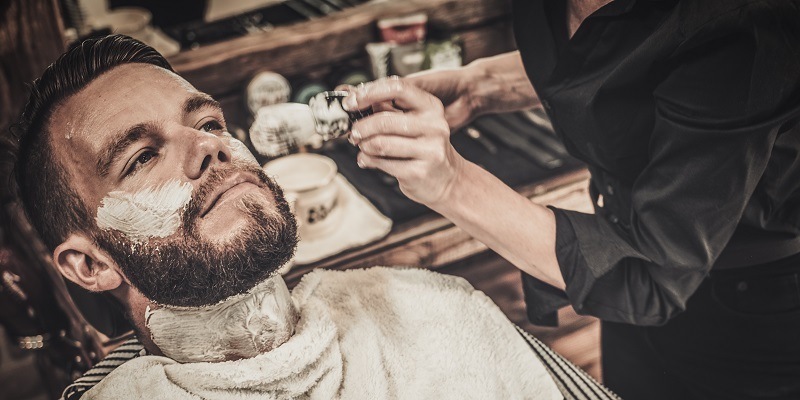 Not only does shaving cream do the lathering for you (with some products), it also tends to contain higher amounts of glycerine, which yields a much slicker shave. It lasts longer. Shaving soaps usually last quite a bit longer. This is especially true if you buy a triple-milled soap (soap that’s gone through the milling process three times to harden it and get rid of moisture). So you’ll probably end up saving money. It’s more traditional. We like to think of shaving as an experience, not a chore. Shaving soaps are a bit more traditional, and to us, working up the lather from a good shaving soap is part of the fun. Shaving creams have short expiration dates. It’s just the nature of the product. Shaving creams tend to go bad after a while. Shaving soaps have a much longer shelf life. Prepare your area. First, make sure your shaving area is clean. Your brush will be soaking in your sink, so you don’t want grime and germs floating around in there. After you have your materials and products ready to go, let your water run until it gets nice and hot. Then, stop your sink, and let it fill about half way. All sinks are different, but the most important thing is that you want to be able to submerge your brush. Soak your brush. Set your brush in the sink full of warm water. If you can stand it on its handle (which is usually possible with a quality brush), that’s easiest. If not, you may have to hold the brush with your hand. Soaking the brush softens the bristles and takes in water, which is important for your lather. Wet or steam your beard. You want your beard to be ready for shaving. Saturating it with warm water makes your stubble softer and more pliable, which makes it easier to cut. The simplest way to do this is just to take a nice, long shower. But you can also soak a towel in warm water and rest it on your face. If you use a towel, wet your face two or three times. Load your brush. Since we’re going to lather (not all people lather shaving cream, since it’s essentially pre-lathered), you’re going to need less shaving cream than you think. Load your brush with enough shaving cream to saturate the light bristles (if you have a silver-tip brush) or a about 3/4 of an inch. Lather the cream. Using your shaving mug and shaving brush, begin whipping your shaving cream into a slightly more aerated lather. The amount of whipping you need to do will depend on the product. For more gel-like shaving creams, you may have to do a bit more whipping. Add water as needed. What you’re looking for is a nice, stiff lather that looks basically like whipped cream and stands in stiff peaks. Apply to face. Use your brush to massage the shaving cream into your face in tight circles. Don’t be afraid to spend some time here. The goal is to fully lubricate your skin, hair and pores, which will make your shave much more comfortable. Like with any shaving product, you should experiment until you find a product that is right for you and your face. Everyone’s face is different, and it just takes a bit of trial and error. However, if you’re looking for a place to get started, here are some of our favorite shaving creams. And remember, don’t be afraid of shaving soap! It will take a bit more practice, but it’s also a lot of a fun. Plus, as we mentioned earlier, if you go with a triple-milled soap, it will last forever and probably save you a good chunk of change. (Oh, and in case you’re forgotten, don’t eat your shaving cream. Apparently, there are people out there who do).